Here’s a really simple way to make a spring healing salve that you can keep in a small pot and use to alleviate and soothe bruises, insect bites or rough skin, or as a lip balm to reinstate your luscious lips! 1. 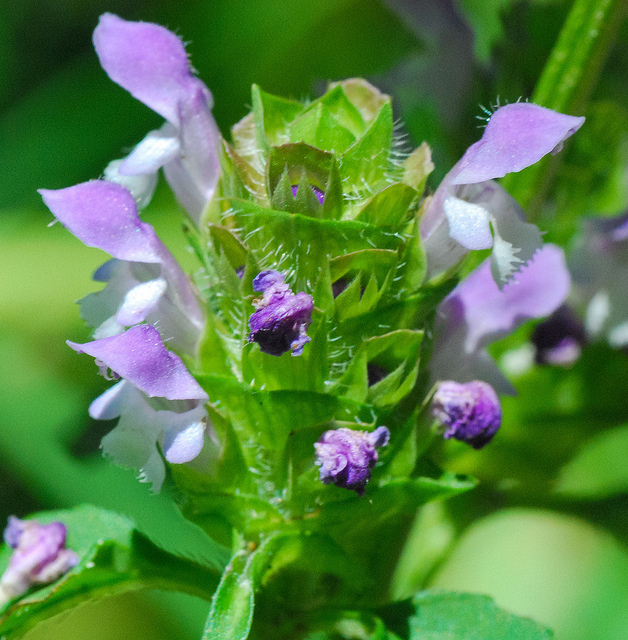 ID your local patch of selfheal and plantain & pick a handful, not over-harvesting in an area of limited resource. 2. Chop up the wild herbs and bruise in pestle and mortar. 3. Pour oil into a bowl, preferably stainless steel then steep the plants in oil, ensuring that the oil covers the plant. 4. Place a clean tea towel or piece of muslin over the bowl of oil and leave over a very gentle heat (back of wood burner / airing cupboard / under a storage heater or radiator). Avoid simmering the oil as it changes the chemical composition of the medicinal properties of the plant. If you don’t have an overnight heat supply, you can heat very gently over a pan of steaming water (bain-marie) for a few hours. 5. Next day, filter the oil through a strainer, unless you’re using a very refined filter, you’ll notice that some of the plantain sediment is left in the oil – this is fine, if you’re fine with it! The oil should have taken on a really wonderful green hue which is thanks to the plantain! 6. Place the strained oil back in the stainless steel bowl and rest in a saucepan of hot water using the bain-marie culinary method that allows steam to heat but not boil the oil. Place the beeswax into the oil, starting with a smaller quantity to begin with. The rough ratio of oil to beeswax for a lip balm is 1part beeswax to 4-7 parts oil – to suit your preference, so just start with a few small spoons first. 7. Once the beeswax has melted, test the solidity of the oil by dipping in a cold teaspoon and pouring a tiny bit on a cold saucer. It will solidify quickly and if it’s too moist, add more wax to get a more solid balm. 8. When you’re happy with the consistency add about 20 drops of essential oil. Lavender is a great addition to the salve and adds a freshness and lightness to the fragrance. The more oil you add, the stronger the aroma and the more it will become like a solid perfume. 9. Finish by pouring the mix into the pots and allow to cool and solidify. When using don’t apply to broken skin. These little pots of balm bliss are fantastic for friends as presents whether as wedding favours, birthdays or just good old spontaneous giveaways!